Artists Gerardo Cazares and Orlando Martinez drive around Chicago collecting campaign signs to repurpose for art after the 2019 mayoral elections. A couple of young artists who did not vote in the historical run-off election drove around their Southwest Side neighborhoods the day after to remove campaign signs that littered intersections, sidewalks and playgrounds as far as the eye could see. 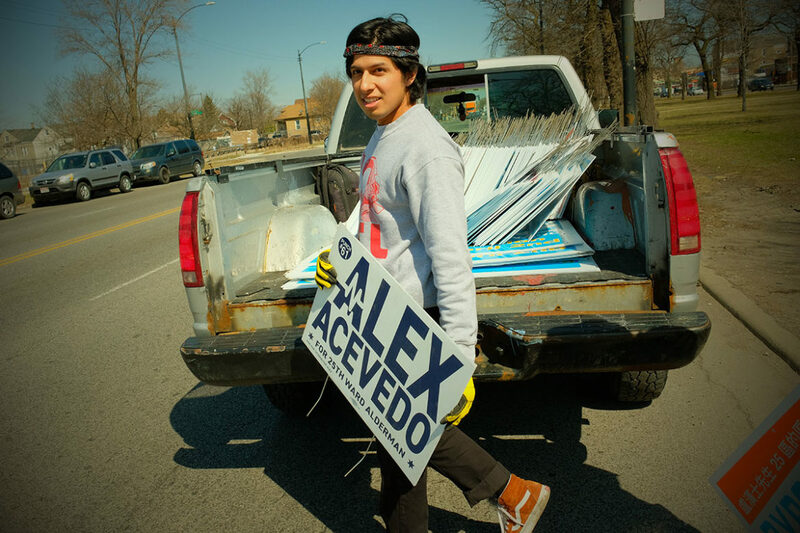 Gerardo Cazares, a McKinley Park resident, drove his grey Chevy pick-up truck along Western Boulevard as Orlando Martinez jumped out to unearth rows of signage for 15th Ward Ald. Raymond Lopez and Mayor-elect Lori Lightfoot. “I saw the amount of waste, the amount of material, the amount of printing, and I was uncomfortable with all the money involved. I wanted to clean up the mess and I thought it was a really interesting material that was waterproof and almost indestructible,” Cazares, 28, said of the first time he picked up signs years ago during local elections. “It’s definitely not biodegradable. It will be a thousand years before that thing melts. I don’t see any recycling symbols on them,” he said. That’s because they aren’t recyclable, according to the city’s recycling program. The law is not clear on the disposal of campaign signs; it mainly addresses the placement of propaganda 100 feet away from a polling place. The Department of Streets and Sanitation normally removes campaign signs from public property, but otherwise they become eye sores that residents have to clean up themselves. Unsure of the purpose they would serve at first, Cazares took the corrugated plastic signs 10 miles north to AnySquared, an art collective in Logan Square that claims to be self-sustainable, inclusive, and politically independent. 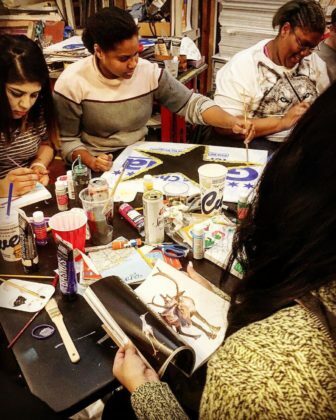 Cazares has attended their Wednesday open studios since 2015 after finding that, outside of the graffiti underground scene, there were few options for South Side youth who were interested in art. With the collective’s support, he built a portfolio that helped him land a job as a teaching artist at After School Matters. The stack of political signs they collected on Wednesday is as tall as Cazares, who stands a full six feet high. In past elections, he has brought in several truckloads. Artists repurpose campaign signs at the AnySquared art collective in Logan Square. The plastic turned out to be useful for structures, stencils, protest signs, and general visual art experimentation. The H-shaped wires used to stake the signs to the ground are the most costly aspect of them, which the artists also reuse in a variety of ways like framing and sculpting. AnySquared actually operates out of Tracy Kostenbader’s home above a Mexican restaurant at 2328 N. Milwaukee. She and her roommates have an open-door policy that attracts self-taught artists from the farthest reaches of the city. “Even if we are not overtly political, the things we do are very political because we’re uniting a lot of different people and communicating across communities,” said the 50-year-old painter who’s been renting the place for 27 years. The group accepts donations of house paint, paintbrushes, and raw material yearound. “We are so DIY we don’t depend on politicians. Our culture here is we basically figure things out ourselves because the system and the money-people don’t support what we do,” Kostenbader said. Still, Kostenbader points out that affordable rent is the most urgent issue for artists and Latino residents in the 1st Ward. She’s glad to see Ald. Joe Moreno get voted out after he rezoned the area around Milwaukee Ave. that allowed for multi-story luxury development to go up next to her home. Her landlords have been sympathetic about raising her rent, she said, but as their property taxes have climbed across the years, so has her monthly rent, tripling from $650 to $2,000 since she moved there. Kostenbader hangs up the phone on developers who call her, sometimes out of state, to offer them mural opportunities and gallery space in their shiny new buildings. “They think hungry artists will do anything. But I tell them no thanks, I don’t want to have anything to do with you,” she says. Her integrity is how she’s gained the respect of dozens of artists, including people of color and LGBTQI-identifying folks, Cazares said. They know they are entering a welcoming environment where they can improve their craft free of charge and prejudice. Ever since he helped repaint the Casa Aztlan mural that was painted over by developers in Pilsen, Cazares has gotten serious about involving the community in his artwork and protecting historically significant public art from erasure by developers and city workers. “They are incentivizing local art as a means to develop a community in the interest of private real estate developers. You know, artwashing communities,” he said. Statistics show that people under 24 years old vote less than other age groups, and the stereotypical working-class artist is believed not to engage in electoral politics at all. But as the young creatives who are repurposing campaign signs are demonstrating, young residents and artists have a grasp of the issues affecting their communities and are finding ways to address them outside of the ballot box. Public art tackles social and political topics in Humboldt Park, the Lower West Side, Kenwood, East Garfield Park and other neighborhoods in the city. 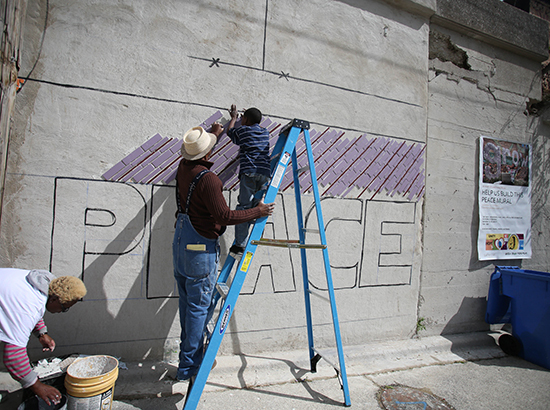 Each Saturday this month, community members from Englewood and Woodlawn will build the public-art project to promote peace in their crime-weary neighborhoods.